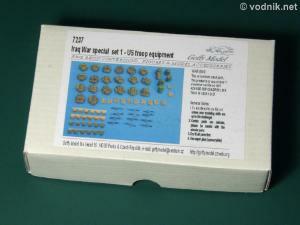 The set from Czech manufacturer contains a lot of resin parts, which should be very useful for small scale modelers building OIF vehicles. In the small cardboard box we get a single resealable plastic bag with all resin parts inside. On the box lid is a label with picture of painted contents of the set. There are no painting instructions provided and mentioned picture is not clear enough to be of any help. In the set we get 20 MOLLE packs in five varieties (different layout of attached sleeping mats, canteens etc. 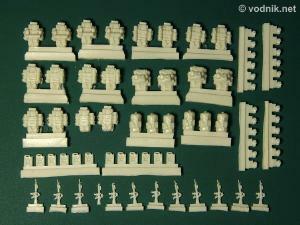 ), six duffel bags, 24 "Fritz' helmets (each straps inside and with goggles), 12 plastic type water cans and 12 M16 A2 or A3 type rifles. There is some flash on parts, but not much. Parts are almost bubble-free and have very well sculpted and crisply cast details. Resin casting blocks should be easy to remove from most parts - only helmets will require very careful cutting to safely separate them from resin blocks. 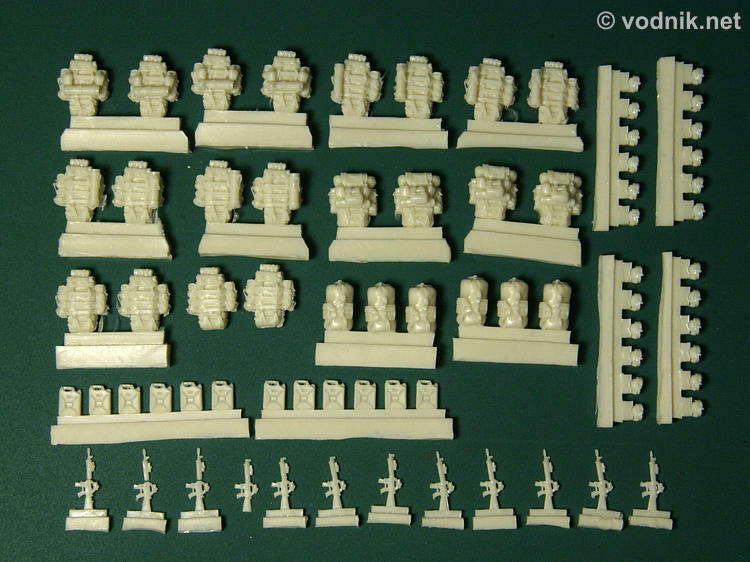 Only serious problem with resin parts in the set I received was with the rifles - half of them had barrels broken off. Some only lost the muzzle, but three lost complete barrels with barrel grip. Actually all barrel parts were still in the bag, so reattaching them should be possible, but this suggests that Goffy should improve their packaging methods to better protect fragile resin parts during transport. 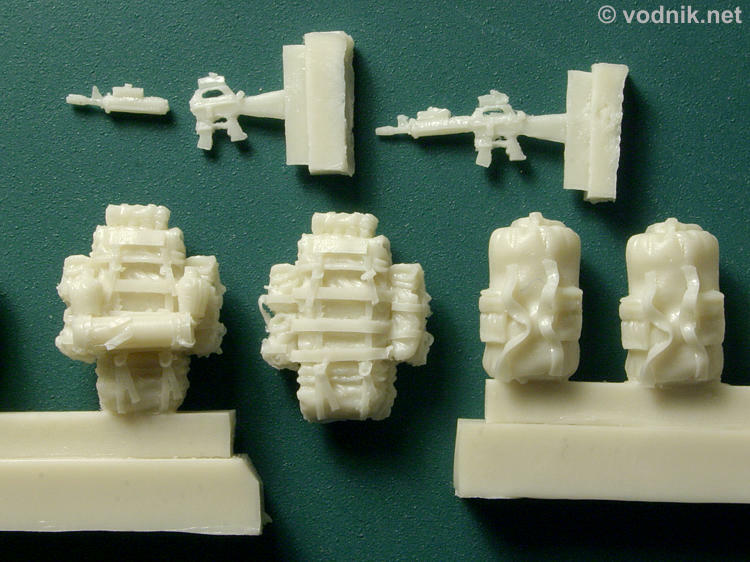 All parts in the set seem to be quite accurate, considering their small size. Only M16 rifles seem to be slightly out of proportion, being correct length, but too high. Rifles have some devices attached on the barrel grip and on upper hand grip - possibly an optical sight and laser marker. All MOLLE packs have nice details molded on front and back side with ultra thin carrying strips molded on. Note broken off barrel of M16 rifle. Goffy set is very well sculpted and almost flawlessly cast. The only problem with my set was the transport damage some parts have suffered. This should however be fixable with little effort. 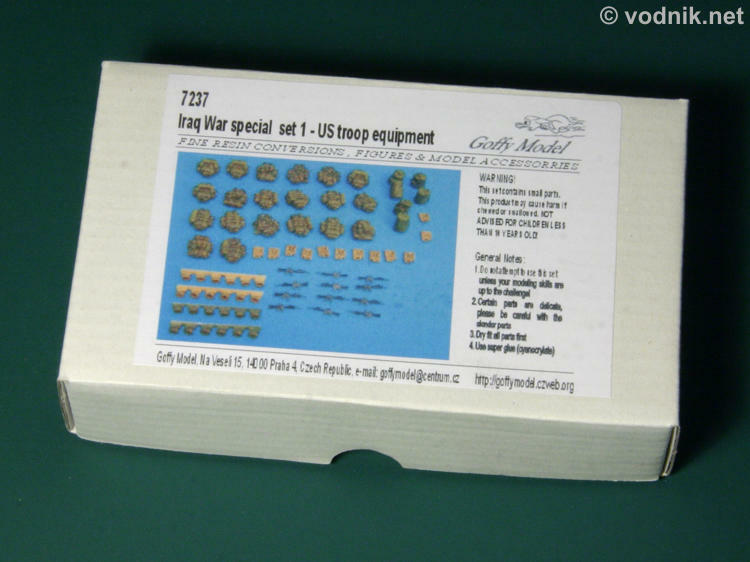 I recommend this set to all small scale modelers building models of US vehicles from Operation Iraqi Freedom, but also from Afghanistan, Kosovo or any other current theater of operation.